The sight and sound of water offers cool tranquility and calmness. 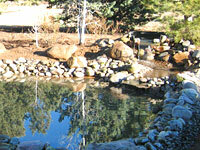 Jeff's Landscaping & Yard Service designs and constructs water features that include fountains, waterfalls, and ponds. A water feature can be simple or elaborate. It can be incorporated in landscaping for the purpose of aesthetic pleasure or mood enhancement. It can be constructed in stylized or naturalized design. An inviting oasis is complete with the addition of a water feature. A water feature creates interest in outer parts of a landscaped area. With the addition of falling water from a fountain or waterfall, a secret garden or secluded seating area, that is removed from the central part of activity, provides a lush, calming sanctuary. The addition of a pond adds peacefulness, moderates temperature on a hot day, provides habitat for beneficial insects such as dragonflies and offers the opportunity to enjoy water-loving plants such as waterlilies, sedges and cattails. View some examples of water features we have installed. Would you like to enhance your outdoor space with a water feature? Call Jeff's Landscaping & Yard Service toll-free at (877) 820-0863 or Request a Quote directly from our website.